As we see ‘Black Ops’ we automatically think about the FPS game. 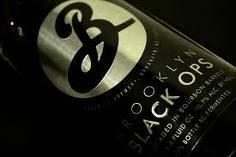 But there’s also a beer called Brooklyn Black Ops Beer. I have to say, the bottle and label looks really nice! This beer is brewed in New York at Brooklyn Brewery. It’s a Russian Imperial Stout (11,60%). So it’s quite a heavy beer. The Black Ops beer was aged (4 months) in bourbon barrels, bottled flat and then re-fermented in the bottle with…Champagne yeast! This beer can be bad!